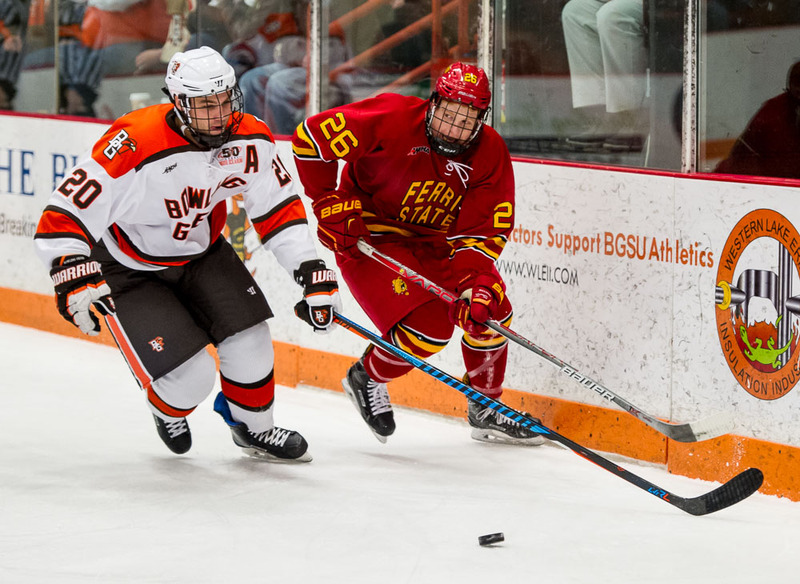 Bowling Green's Matt Pohlkamp (left) controls the puck as Ferris State's Joe Rutkowski closes in during Friday's game (Photo by Todd Pavlack/BGSUHockey.com). Matt Pohlkamp is striving to finish his Bowling Green career with a flourish in the Western Collegiate Hockey Association playoffs. The assistant captain is off to a strong start. The senior right wing had two goals and two assists Friday to lead the Falcons to a 6-1 win over Ferris State in Game 1 of their Western Collegiate Hockey Association quarterfinal series at the Slater Family Ice Arena. Pohlkamp and junior linemates Mitch McLain and Tyler Spezia dominated. McLain also had two assists, while Spezia had one. The three combined for 11 shots on goal and were a combined +10. McLain and Pohlkamp combined to block five shots. McLain centers the while, while Spezia plays left wing. “I had a blast tonight,” Pohlkamp said with a grin. The goal was Pohlkamp’s first since Jan. 14 at Minnesota State, totaling only one assist in BG’s last nine games before Friday. “It’s finally good to put some points on the board because I’ve been struggling quite a bit this year for points,” Pohlkamp said. Pohlkamp has a career-high 10 goals and seven assists in 37 games this season to go along with an on-ice rating of +3. He entered the season with 25 goals and 37 assists, including eight goals and 16 assists last season. The line also had one goal and one assist last Saturday in BG’s regular-season ending 2-0 win over Alabama-Huntsville. Friday’s four-point game matched his career high. When Pohlkamp is playing well, he’s one of BG’s best forecheckers, a force around the net and a winner of 1-on-1 battles. He is one of BG’s best penalty-killers and defensive forwards, and also skates on the power play. “It’s been a long battle,” Pohlkamp said of his season individually. “I don’t think I’ve played badly all the time. I haven’t put up the production I’ve wanted to. Playoffs are a new season, and I wanted to get off on the right foot like I did tonight. Pohlkamp’s line and the BG defense pair of senior captain Sean Walker and freshman Alec Rauhauser was matched against Ferris’ top line of sophomore Corey Mackin, senior left wing Jared VanWormer and senior Gerald Mayhew during even-strength situations. 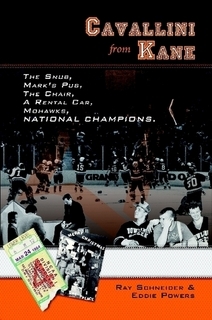 Mayhew entered Friday as the league’s leading scorer with 33 points, including 17 goals. The three have combined for 39 goals and 44 assists this season, including VanVormer’s power-play goal Friday. Ferris’ top line had no shots on goal at even strength during the first two periods when BG built a 6-1 lead. The Falcons held a 2-0 lead in the first period and rolled from there. Spezia and McLain also are solid defensively, and Walker is one of the league’s best blueliners. BG defensemen Adam Smith and Mark Friedman also are capable of defending well and drew the assignment against Ferris’ No. 2 line. “They’re the ultimate combination line,” BG coach Chris Bergeron said of the Pohlkamp line. “They can do it when they’re right. They can check. They’re top-notch penalty-killers, and they’re guys who can create offense and score. The Falcons, 18-17-2 overall and the fourth seed for the playoffs, will try to close out the best-of-3 series Saturday night. A third and deciding game would be played Sunday night. Faceoff is 7:07. Fifth-seeded Ferris is 13-18-5. BG has won four straight games and has played well overall in all four of those games.